Analysis of a contemporary cohort of patients on dialysis revealed that mortality from acute myocardial infarction (AMI) has decreased, whereas the prevalence of AMI has increased markedly, particularly among patients with non-ST elevation myocardial infarction (NSTEMI). Using inpatient discharge diagnosis codes (1993–2008), we determined that proportions of AMI claims decreased in the primary position (from 65% to 52%) but increased in the secondary position (from 35% to 48%). Proportions of NSTEMI codes increased remarkably in both the primary and secondary positions. The progressive increase in diagnostic claims for secondary AMI identifies a unique high-risk population and has important clinical, economic, and epidemiologic implications among patients on dialysis. Introduction of the second and third universal definitions of myocardial infarction (MI) in 2007 and 2012, respectively, led to a sea change in preexisting paradigms.1,2 To reconcile the advent of increasingly sensitive cardiac biomarkers capable of detecting myocardial necrosis in varied clinical settings, an international taskforce of experts compiled a new definition and classification of MI. Integral to the updated definition was a requirement for elevation in cardiac biomarker levels (above the 99th percentile) with a rise/fall pattern in the appropriate clinical setting corroborated by clinical symptoms or electrocardiographic, imaging, or angiographic evidence of coronary occlusion. The updated clinical classification differentiated MI on the basis of pathophysiologic mechanisms (Table 1), specifically categorizing type 1 MI (spontaneous atherosclerotic plaque disruption and thrombosis), type 2 MI (ischemic supply/demand mismatch), and others occurring in the context of cardiac arrest or coronary revascularization. This updated definition and classification of MI represented a new benchmark that was subsequently incorporated by clinicians, clinical trialists, and researchers alike. The universal classification of MI provides no unique guidance pertaining to patients on dialysis, a high-risk population with high baseline prevalence of elevated troponin levels unrelated to MI.3 We applied to and received approval from the Human Subjects Research Committee of the Hennepin County Medical Center/Hennepin Healthcare System, Inc. Acute myocardial infarction (AMI) among patients on dialysis is associated with exceptionally high mortality rates; historically, 1-year mortality rates of 55%–62% were reported from 1977 to 1995.4 However, examining trends in AMI mortality among patients on dialysis in a contemporary cohort (1993–2008) revealed cause for optimism.5 Using the US Renal Data System, we identified period prevalent patients on dialysis with Medicare as primary payer hospitalized with a first AMI in 1993, 1998, 2003, and 2008 identified by International Classification of Diseases, Ninth Revision, Clinical Modification (ICD-9-CM) diagnosis codes from inpatient claims.5 Reassuringly, in-hospital mortality decreased from 32% in 1993 to 19% in 2008 (P<0.001). 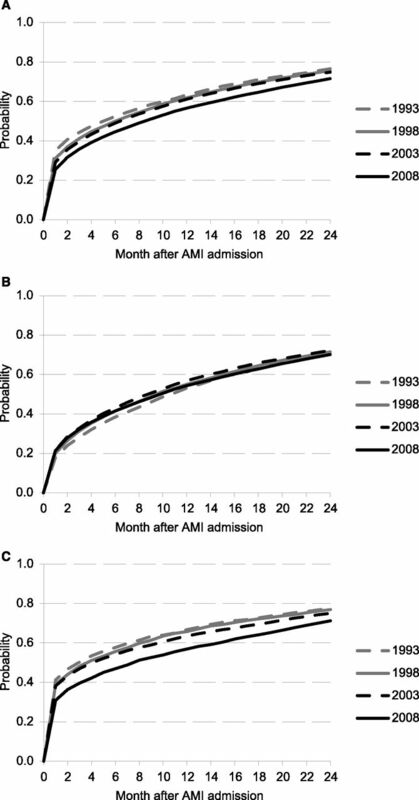 The unadjusted 2-year cumulative probability of mortality after an index AMI admission also decreased (77% in 1993 and 72% in 2008; P<0.001) (Figure 1). However, interestingly, in-hospital mortality decreased only for patients with ST elevation myocardial infarction (STEMI) from 38% in 1993 to 26% in 2008. Conversely, in-hospital mortality for patients with non-ST elevation myocardial infarction (NSTEMI), albeit lower than for patients with STEMI, remained relatively unchanged (14.2% versus 14.9%, respectively; P=0.47). Similarly, the 2-year cumulative probability of mortality decreased among patients with STEMI (77% versus 71%, respectively; P<0.001) but not among patients with NSTEMI (71% versus 70%, respectively; P=0.52). Improvement in STEMI outcomes can likely be ascribed to improved recognition, advances in percutaneous revascularization and medical therapy, adoption of systemic approaches to care, and greater likelihood of successful revascularization in the pathophysiologic context of fresh thrombus. However, mortality rates of patients on dialysis with NSTEMI remained disappointingly stagnant, showing relative imperviousness to clinical advances over 15 years. Trends in mortality following AMI among dialysis patients. Unadjusted cumulative probability of mortality after index hospitalization for AMI in period pravelent patients on dialysis in 1993, 1998, 2003, and 2008. (A) All AMI. (B) NSTEMI. (C) STEMI. Reprinted from Shroff et al.5, with permission. Another important observation emerged from this study: although the frequency of STEMI codes remained relatively constant among patients on dialysis with AMI, the frequency of codes for NSTEMI escalated from 1993 to 2008.5 To explain this remarkable increase in NSTEMI prevalence, we considered two broad possibilities. This observation could represent an increasing prevalence of spontaneous (type 1) AMI due to worsening risk factor control. We also considered the possibility of greater frequency of codes for type 2 AMI (supply/demand mismatch) occurring in the context of higher baseline prevalence of biomarker (presumed troponin) levels among patients on dialysis, evolution of more sensitive assays, and changing definitions. In recent years, type 2 AMI (supply/demand mismatch without coronary thrombosis) has been recognized as an increasingly prevalent and clinically important entity.6 Differentiation between types 1 and 2 MI is an important task for epidemiologic and clinical purposes but very difficult, even for seasoned clinicians. Accurate differentiation of types 1 and 2 MI would require expert adjudication in large clinical cohorts and ideally include coronary angiography to definitively exclude coronary thrombosis. Because this degree of clinical precision is not feasible using administrative observational data, we instead performed secondary analyses to examine trends in diagnostic claims for AMI in the primary versus any secondary (i.e., not in the principal/primary) position. We speculated that patients with type 1 MI (due to spontaneous plaque rupture/thrombosis) would be more likely to have a discharge code for AMI in the primary position, whereas those with type 2 MI (supply/demand ischemia) would be more likely to have AMI coded in the secondary position with the precipitating syndrome (e.g., sepsis, heart failure, respiratory failure, etc.) coded in the primary position. In this secondary analysis, we observed that, although numbers of patients on prevalent dialysis with AMI increased markedly and consistently during the study period (4494 in 1993 versus 16,361 in 2008) (Table 2), the proportions of AMI codes in the primary position steadily decreased (65% and 52%, respectively), with a corresponding increase in the proportions of AMI codes in a secondary position (35% and 48%, respectively). Furthermore, the proportions of NSTEMI codes in the primary position increased (46% and 81%, respectively), but the proportional increase of NSTEMI codes in the secondary position was greater (36% and 80%, respectively). The proportions of STEMI codes decreased drastically in both the primary (40% and 12%, respectively) and secondary (31% and 6%, respectively) positions. To the best of our knowledge, this is the first attempt using administrative data (diagnostic codes) to understand epidemiologic trends in AMI among patients on dialysis. Before drawing any inferences, we acknowledge that it is speculative to conjecture that primary AMI reflects type 1 MI and that secondary AMI reflects type 2 MI without exceptions. The accuracy of diagnostic codes to determine types of MI on the basis of the universal definition of MI has not been validated, and inability to identify an indication for checking biomarkers or a rise/fall pattern constitutes a limitation of administrative data. Clinical exceptions could occur, and coding could be subject to biases in clinical ascertainment and influenced by incentives to procure higher reimbursement. It remains possible that those identified with secondary AMI merely represented a cohort of patients with abnormal cardiac biomarkers in the setting of serious illness (i.e., direct myocardial injury) or chronic biomarker elevation erroneously coded as AMI without fulfilling the strict definition. Nevertheless, because ICD-9-CM code 410 for AMI was used for these patients at hospital discharge, one can assume that they were of substantial concern to clinicians. We hypothesize that this analysis of patients with secondary MI demarcates an equally high-risk but epidemiologically distinct (from primary AMI) population of patients on dialysis in the context of an ancillary primary condition, such as sepsis, heart failure, etc. In the general Medicare population, the frequency of claims for AMI in a secondary position has also steadily increased, whereas the frequency of claims for AMI in the primary position has progressively decreased over the past two decades.7 The increasing frequency of diagnostic codes for secondary AMI has important clinical, economic, and epidemiologic implications in this high-risk population. Because establishing a clinical diagnosis of AMI in patients on dialysis can be particularly vexing due to lower prevalence of typical symptoms or electrocardiographic changes,8 clinicians tend to rely heavily on biomarkers. This conundrum is more likely to influence the diagnosis of NSTEMI than that of STEMI, and it is more likely to occur in a population with a higher baseline prevalence of troponin elevation (i.e., patients on dialysis). These observational data have limitations inherent to use of administrative claims to infer clinical patterns; it cannot be disputed, however, that patients on dialysis with AMI incur high mortality rates. Use of administrative claims data represents a creative attempt to gain insight into trends in use of diagnostic codes in primary versus secondary AMI and should be considered hypothesis generating for future clinical studies. Additional research should evaluate downstream procedures and revascularization among patients with secondary AMI, because inability to do so is a limitation of this study, and it should evaluate resultant effects on mortality. It would be instructive for future coronary angiographic studies to assess whether anatomic location or lesion characteristics differ with primary versus secondary AMI. In conclusion, diagnostic claims for secondary AMI have progressively increased over 15 years; this observation has important ramifications from the perspectives of clinical care, cost of care, and epidemiologic trends. More clarity in diagnostic coding criteria for secondary AMI is necessary to accurately designate clinical resources and appropriate reimbursement and more precisely delineate the epidemiology of these patients.10 The increasing prevalence of MI in the secondary position merits further attention from researchers and clinicians alike, particularly in the forthcoming era of high-sensitivity troponin assays, which may well exacerbate this issue. The authors thank Chronic Disease Research Group colleague Nan Booth for manuscript editing. The data reported here have been supplied by the US Renal Data System. This study was supported by the Chronic Disease Research Group, Minneapolis Medical Research Foundation.